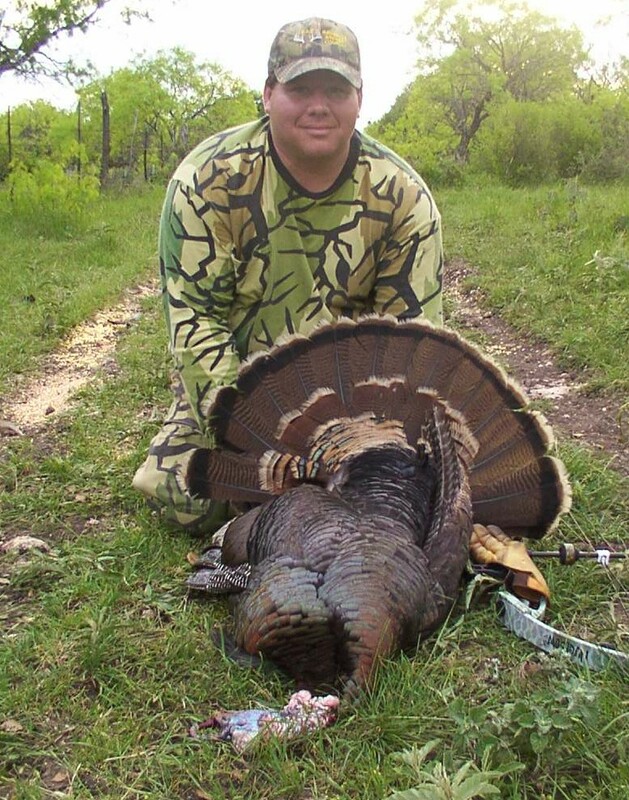 Brandon offered to hold a drawing to hunt wild turkey on his ranch in Menard Co., Texas. 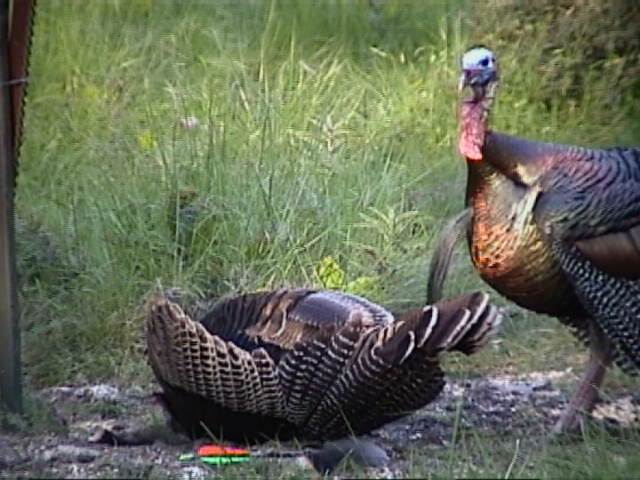 Tammy and I both have wanted to add a turkey to the list of game animals we want to harvest together as a team. 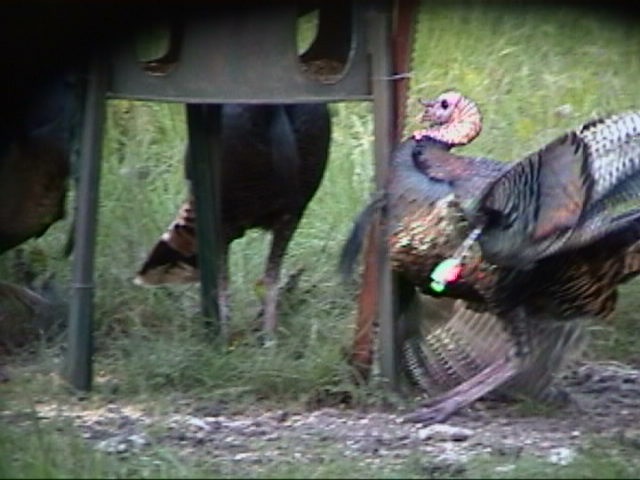 We kept watching the calendar and counting down the days…by Easter weekend our hunt was right around the corner. Dan “Hogkiller”, David “Bowwiz” and Missy, around the campfire. Around 1A.M., the few of us that decided to stay up late decided to turn in. was very nice but windy. After donning on out hunting cloths and gathering out equipment we headed to our ground blind. see how they could hear our calls. 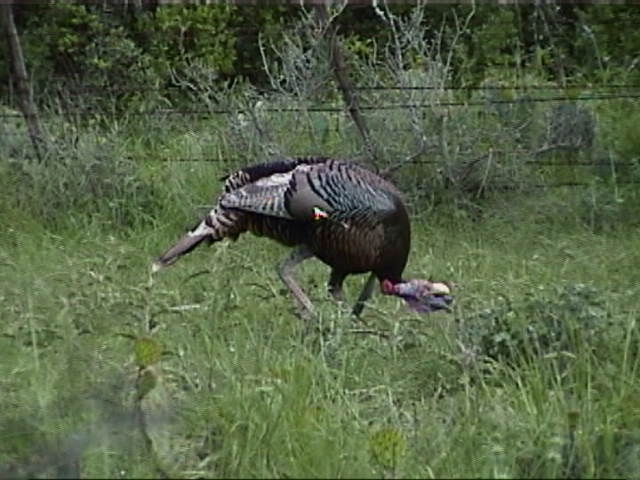 We sat until 9:30 that morning but we never saw a turkey come into our area so we headed back to the ranch house. 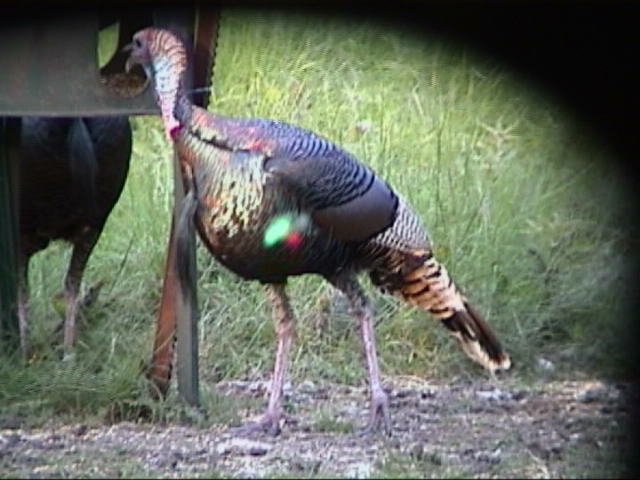 cruised over to other feeders around the ranch to make sure they were all working and fill turkey feeders. We went to Brandon’s blind and we ran off 5 good Gobbles. We filled the feeders and left. We went back to the ranch house, had lunch, and decided to take a nap. But first we needed to have a photo session. 9-3/4” beard. “Flingers” Tom had a 10” beard. birds but plenty of gobbling all around us. and saw over 30 birds under the feeder. However, nothing was coming in now. his blind for the Saturday evening hunt, if we didn’t get anything the next morning. Saturday morning came and went with the same results…NOTHING! in from their morning hunts. Everyone got skunked. The gale force winds we were having had grounded our birds. 11am until the heat was unbearable and left around 2pm. 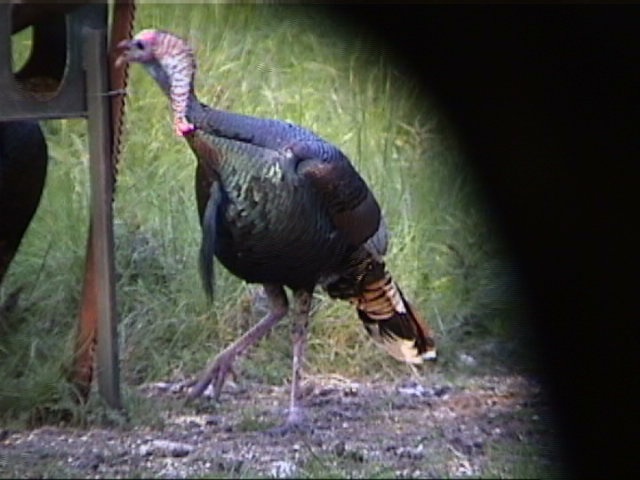 We didn’t see anything after the two Toms ran off so we headed to camp. down to see if anyone was catching anything. They were skunked and we didn’t feel so bad. a cactus, we settled into the stand. 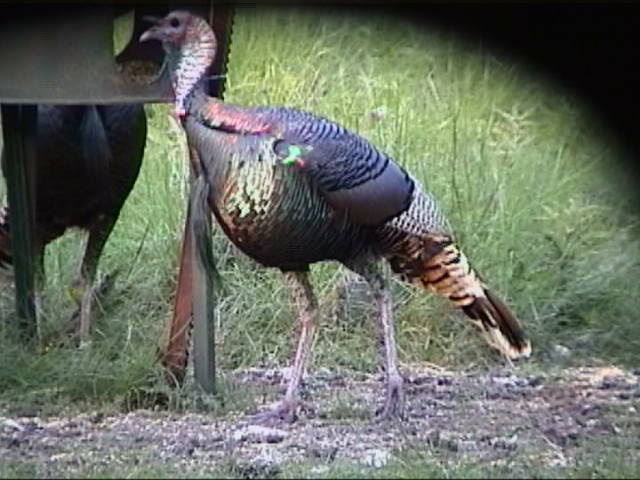 finished a hen walks up to the feeder 12 yards away. Tammy is up to shoot first. 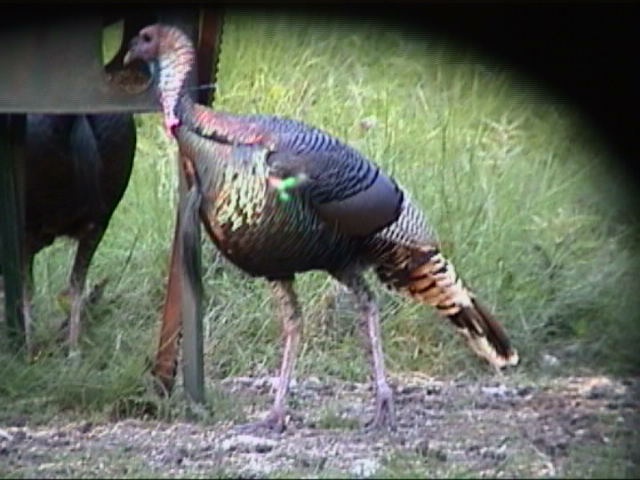 She is waiting for a gobbler. 15 minutes later the hen leaves but is replaced by a bearded hen. for anything if you shoot the hen and gobblers exploded from the brush behind us. else. As he clears the bushes I can see he has a 12” to 13” beard. 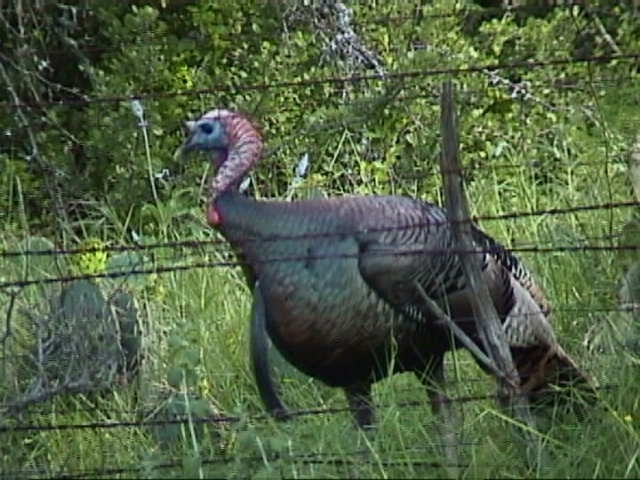 He is an old Tom and wanting to be on our side of the fence. and both fly over the fence and begin eating grain we poured out. but he is big that he can’t get through it. 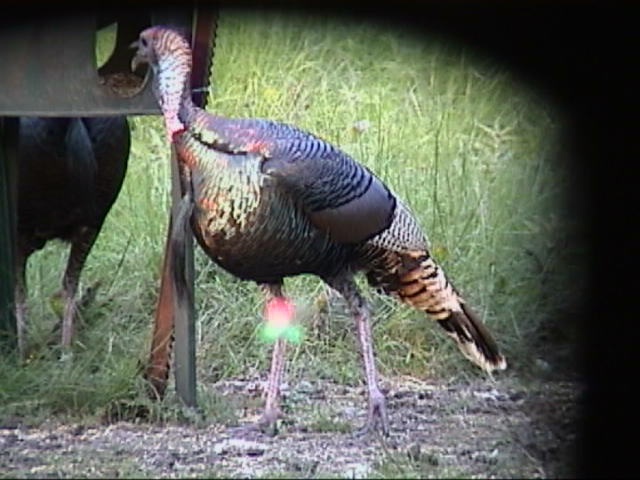 could see the turkey turn. Frame 3: Arrow is almost there Frame 4: Arrow penetrates and Lumenok is lit. 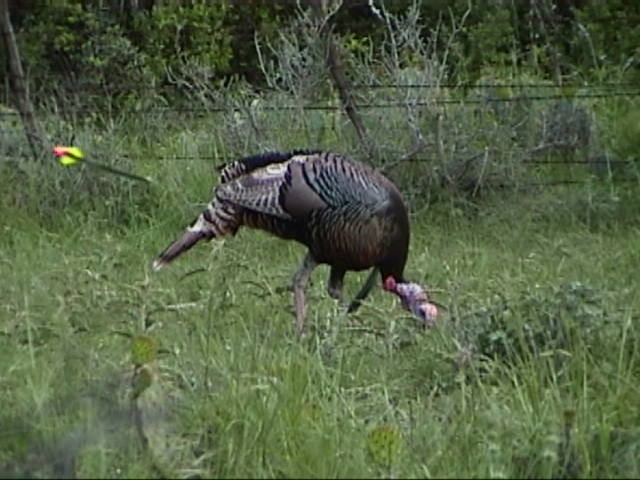 The turkey is hit just under the wind bone and feathers fly everywhere. 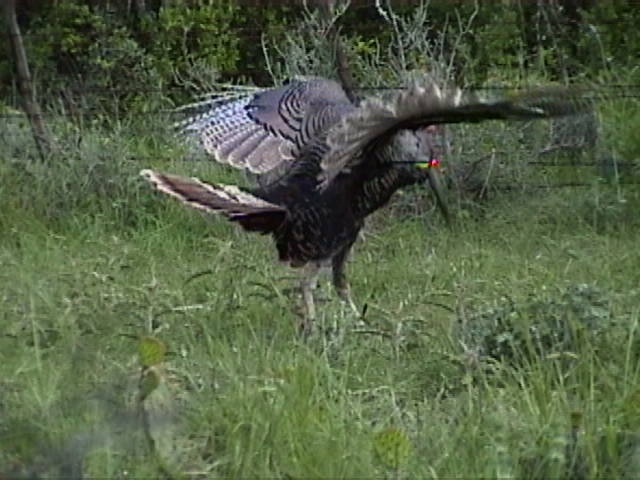 The Tom jumps and flaps his wings. I kept rolling video for a couple of seconds more and stop. I stopped filming and bailed out of the stand. 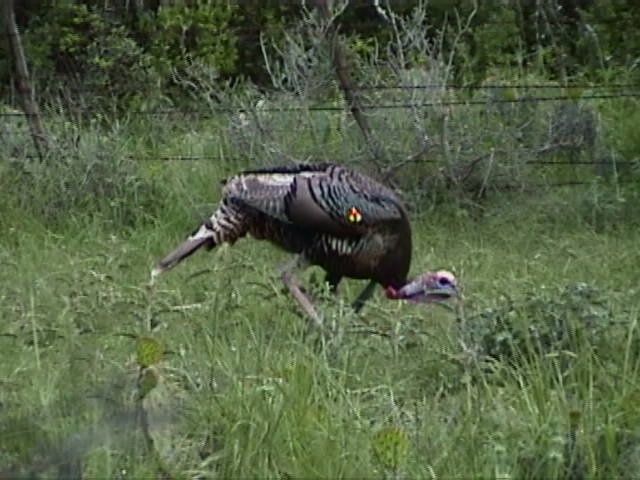 The Tom is in flight and I loose him going over the mesquite trees. I run but he is gone! We look for a few minutes and then review the video. Other than the wind not being broken it was a good hit. Tammy was a very upset and heart broken since she lost her first ever turkey. We get back in the blind and I tell her to get her stuff ready. I wanted her to get one before me! But Tammy tells me to get my bow and stands up. I wanted her to get hers first but I wasn’t going to say no to the offer. In a short time I was in position. 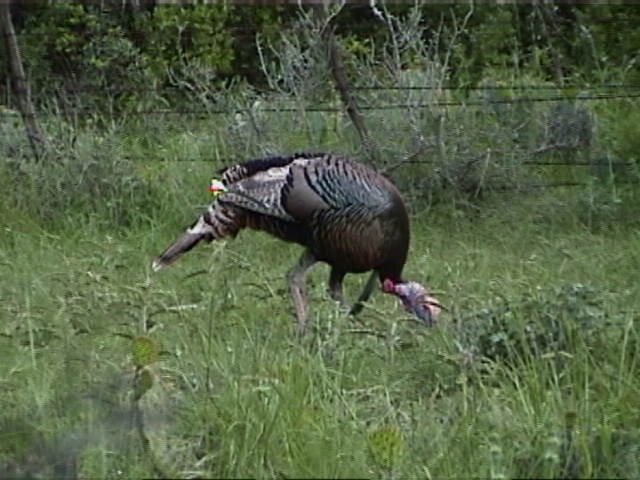 The turkeys start towards the fence but hang up 40 yards away. We tried to call but they were not coming any closer. myself in a good kneeling shot. stretched and he is broadside. I draw my Renegade “NugeBow”, steadied my Copper John Sight pin on the left wing which covered his chest. broadhead and grasshopper towards the long beard. Frame 7: He falls Frame 8: Nothing but the 12 ring. Thwack! Feathers fly everywhere…a repeat of just what happened 20 minutes ago. head. Then all of a sudden the two other Toms that were with him start attacking him. unzipped the blind the two other birds take off. I retrieve my bird. leave the blind and continue looking for her bird. almost stepped on a 6’+ rattle snake we called off the search. 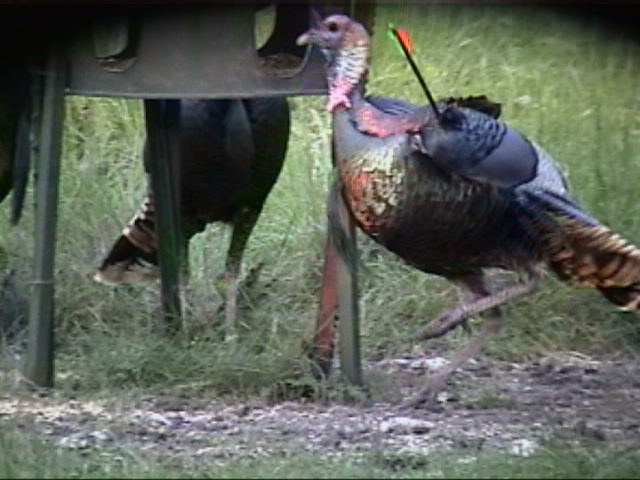 We headed off and began taking some pictures of my bird along with the bird “Flinger” shot. After the photo shoot we were ready for the mudbug (crawfish) boil and campfire chat. Sunday morning was uneventful and by 9:00 A.M. we ended the hunt, clean up and head home to our boys.